Today I drilled and tapped the holes for the bolts which secure the crankshaft main bearings. I had accurately marked the bearing mounts in the previous session (see previous photos), and calculated and recorded the DRO (digital read out) position for each hole. So going back to that position for each step in the process was easy and quick. The steps today were centre drilling, drilling the 3.3mm holes, and tapping the 4mm threads to a depth of 20mm. Centre drilling is done with a centre drill bit in an accurate chuck in the milling machine. Centre drill bits are inflexible and will not wander over the work like an ordinary twist drill bit, The centre drilled hole is deep enough to create a chamfered edge to the hole. All 12 holes are drilled with the centre bit, then all 12 drilled with the 3.3 mm bit, then all 12 are threaded. The DRO positions the work within 0.005mm each time, and the repositioning is very fast, much faster than going to a position doing all 3 processes, changing the bit for each one, then moving to the next position. The threading was done with a Tapmatic 30 tapping head in my milling machine. See photo. This takes about 10 minutes to set up, but the tapping process for the 12 holes then took about 5 minutes. I use Rapid Tap lubricant for tapping, even in brass. I guess that manually tapping the holes would have taken about the same time, but it was so satisfying to see the Tapmatic do its stuff. 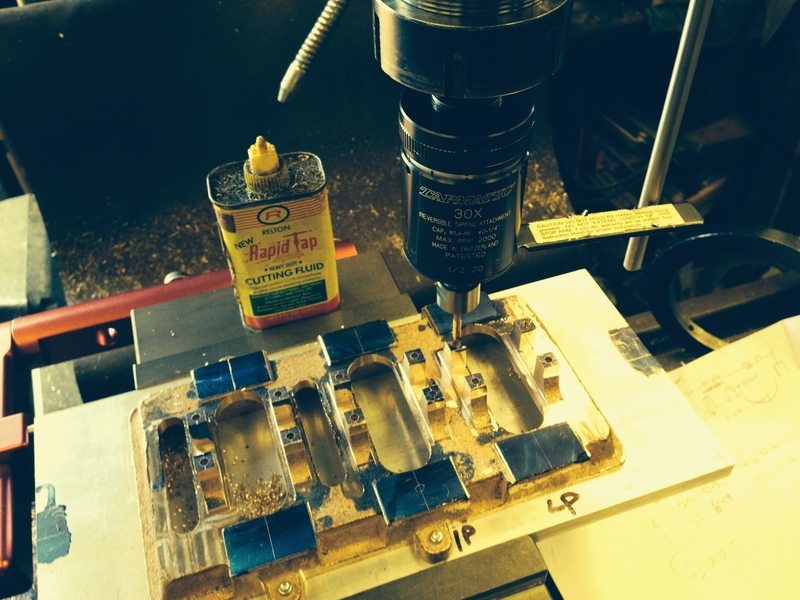 I use the Tapmatic for any tapping job involving more than about 8-10 holes. Fewer than that it is quicker to do them manually. The Tapmatic has a adjustable clutch. I have never broken a tap in the job using this machine. Incidentally, I have decided to use nuts and bolts and screws and studs in preference to metric cap screws for this model. The appearance wins out over practical expediency. So why the metric threads for this job today? The specified thread was 5/32″ which is 3.96mm, so I decided to go with the 4mm metric, for which I have the tools already. Tapping the main bearing blocks using the Tapmatic and Rapid Tap. 5/1000 of a millimetre is impressive. Have you checked this or is it the specification for the machine? How does that accuracy degrade with number of visits? Good question. It is the specified accuracy of the DRO. More expensive DRO’s go down to 0.001mm! It is independant of backlash in the leadscrew of the mill, but I think that it would be dependant on accuracy in setting up the DRO originally, to make sure that the scale of the DRO is parallel with the mill table and not introducing an inadvertent angular inaccuracy (a so called “cosine error”). Number of visits should not degrade accuracy, except that old DRO’s can develop “skip” errors which I think is like a worn gear skipping teeth. I have never experienced that. DRO’s are incredibly impressive. You should eventually fit them to your lathe. I wouldn’t bother with your mill. When you want to improve the accuracy of that one you will want to get a better mill.